I am so upset. Have mercy on me and hear my prayer. When will people stop shaming You, deluding themselves and turning to gods of their own making. God sets apart the faithful and hears when they pray. Reverence God in your prayers. In the silence search yourself for sin and repent. Shine down on us Lord! Prosper us! Fill us with the joy of Your provision. Now then, I can sleep safely knowing You alone are here! Please note: This is how God speaks to me through His Word. It is not meant as another translation or transliteration. It is simply what it is. My fervent prayer is that you will take His Word, listen to the Spirit within, and use it as He intended…to guide your own life. 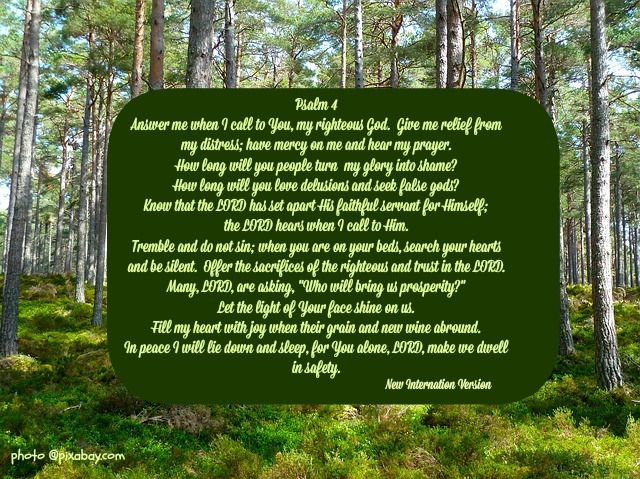 This entry was posted in Psalms and tagged Holy Spirit, New International Version, Psalm 4, Trust God by Marie. Bookmark the permalink. One thing that caused a great change in my Christian focus, was I took to heart Jesus’ words telling us to ask, seek and knock so we can be complete and in having done so I have been greatly blessed but so many don’t which is why He said they don’t have because they don’t ask or they do so without faith or with the wrong motivation, sadly so many do not listen. Blessings heaped on you, Anne!